Maybe you have read it while brushing the technical specifications of the top of the range Android smartphone you want to buy for a long time. And, maybe always, you started asking yourself what USB on-the-go is and what it’s for . And, above all, because it is a feature that is easier to find in the technical sheet of high-end devices than in the mid-range or medium-low range. But let’s proceed with order. Often abbreviated to USB OTG or simply OTG , USB on-the-go is a collection of communication protocols belonging to the USB 2.0 standard (and later) that makes its first appearance in 2001. These protocols allow any device equipped the Universal Serial Bus can act both as host both devices : this way devices such as keyboards and mouse, gamepad and USB sticks can be connected to a smartphone or tablet (or any other compatible USB device OTG) that feed them and they exploit the functionalities. The OTG standard defines two different roles for each supported device: OTG a and OTG b . The first acts fromhost and is, in the pair, the one supplying the electrical energy necessary for the functioning of the second. It must be said, however, that this communication standard is not exclusive to Android smartphones . Being part of the specifications of the USB 2.0 standard, all compatible devices could take advantage of its characteristics and peculiarities. It is the manufacturer of the device or device that decides to turn on or off the OTG of its device, providing the necessary software to manage the communication flows and, therefore, to make it fully functional. To guarantee the full functioning of the OTG devices, three new communication protocols have been included within the 2.0 standard (and following) , which determine the same number of phases in the exchange of data and information between two USB devices compatible with the OTG. Attach detection protocol (ADP) . It allows a USB device to check and check whether or not electric current flows in the circuits. The verification takes place at regular intervals and allows the device to check if it is connected to another OTG device, to a USB cable or if the door is still empty. In the event that a change in electrical potential is detected in the circuits (a sign that, on the other hand, there is “something” waiting to receive a signal) the USB device will start to power the other, while the device will generate a SRP. Session request protocol (SRP) . The role played by this protocol is, as can be understood, consequential to that of ADP. Once the user has connected thedevice to his host , with the SRP a communication will be established between the two USB devices and will allow both to manage the flow and current consumption. A very important protocol, therefore, especially in the case where the OTG a is a battery-powered device (such as a smartphone or tablet) and the limited autonomy. Host negotiation protocol (HNP) . Even if the role of OTG a is usually carried out always and only by a certain type of device, it may happen that during the same “connection” session the two devices exchange roles. As we said, in fact, USB on-the go allows a USB device to perform both the host and device functions and, thanks to the HNP protocol, this operation takes place automatically, allowing what was an OTG b to take control of the situation and manage data exchange with the other device. 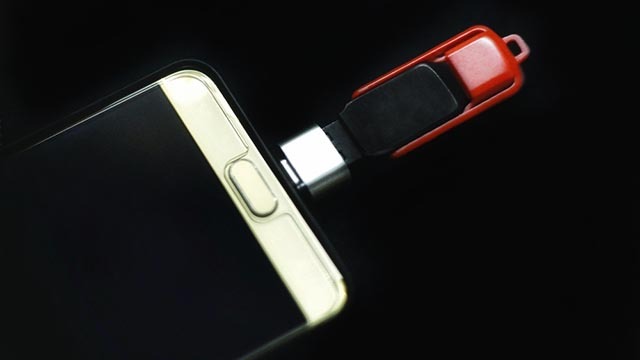 How to find out if your smartphone supports USB on-the-goWhile not an exclusive feature, it is useless to deny that smartphones are the first devices that come to mind when it comes to USB on the go . To verify that your mobile device is compatible with OTG protocols you can follow different paths. First of all, just check if the box is printed with the “USB on-the-go” logo, as in the image. Alternatively, you can search for your smartphone model on the GSM Arena portal and verify that the “USB host” specification is in the data sheet. Last but not least , you can rely on USB OTG Checker, a free Android app downloadable from the Play Store, which will check the compatibility of the device with protocols on the go . In the event that your Android smartphone supports OTG protocols, you can start connecting USB devices and expand their functionality. First of all, however, we would need an OTG adapter cable that allows the two devices to communicate without problems. 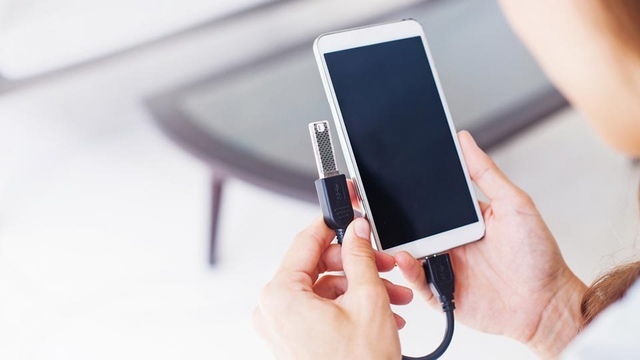 Thanks to the cable, for example, we could connect a USB stick to our smartphone and free the memory of the mobile device. Or, again, connect your mouse and keyboard and turn it into a sort of tiny portable PC. Not to mention, then, the ability to connect a USB joypad (like those used by the Xbox) and have more control over video games for smartphones. In short, the only limit to the use of USB on the go seems to be imagination.